In the summer of 2010, the world celebrated the 40th Anniversary of man’s first walk on the moon and your Greenwich Workshop Authorized Dealer has a room full of historic open and limited edition fine art at their fingertips for your gift giving and home or office display. Greenwich Workshop Artist and Apollo Astronaut Alan Bean was the subject of a one-man show at the Smithsonian’s National Air and Space Museum featuring forty of Bean’s original drawings and paintings from July 16, 2009 until January 13, 2010. 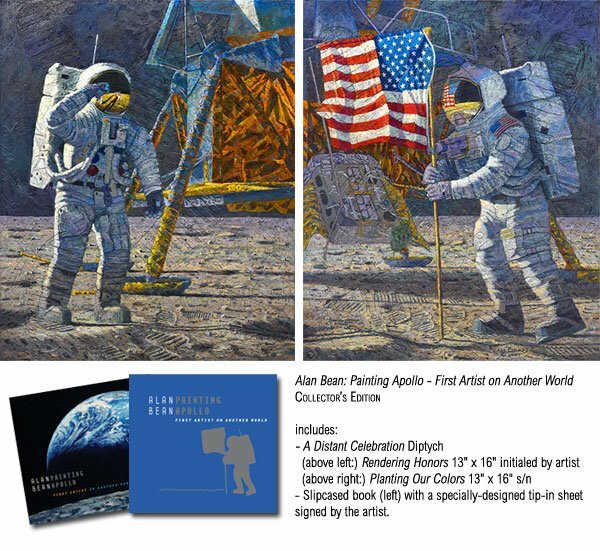 Some of these Apollo inspired paintings are available in Fine Art Limited Editions, many with historic counter-signers in addition to Astronaut and Artist Alan Bean. In July 2009, Smithsonian Books published "Painting Apollo: First Artist on Another World," to coincide with the 40th anniversary of the Apollo 11 moon landing. The Greenwich Workshop produced this very limited Collectors Edition diptych and signed, slipcased book. Artist Alan Bean’s diptych portrays Apollo 11’s Neil Armstrong and Buzz Aldrin as they erect and salute the American flag on the surface of the Moon. It is a moment that will live in history forever, and in the collective memories of the millions of people who saw it live on television. There was so much to celebrate! We, the United States of America, had won a very real race to show which country could land men on the Moon and return them safely to Earth. This amazing achievement demonstrated the collective will and capability of over 400,000 American men and women doing their jobs with care and precision.